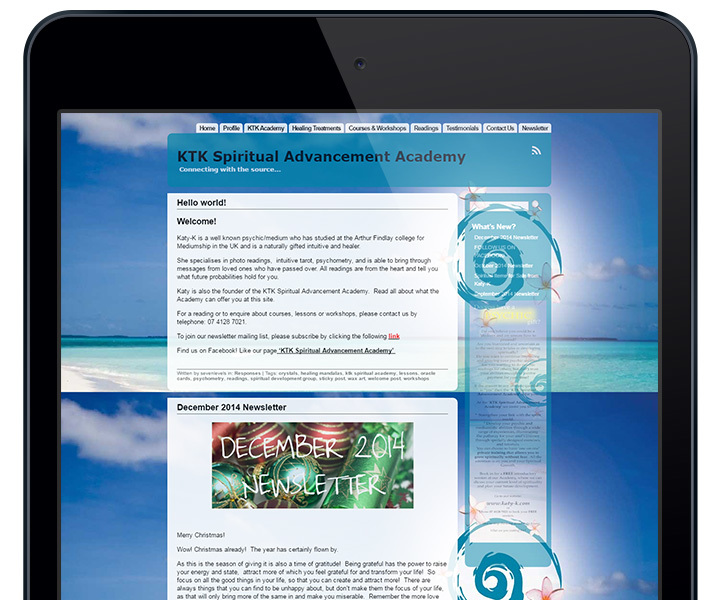 Katy-K’s Spiritual Advancement Academy is a valued, long-time client of Jen Mulligan Design. 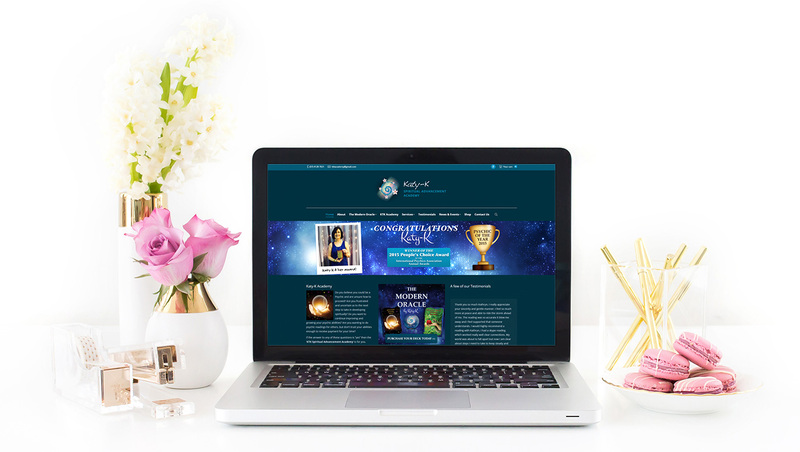 We’ve worked together to redesign Katy’s website and transform it into a one-stop-portal for everything Katy-K. The website features a range of built-in customisations including: upcoming workshops & events, tutor listings, stockists, online store, blog/latest news and photo galleries with more being added by the day. The website is based on the popular content management system, WordPress which allows the client to log in and manage the website and orders through the online store themselves. Jen Mulligan Design also worked with Katy-K to design a 53 card deck of oracle cards called the Modern Oracle. These cards are very high quality with luxurious gold edging and a strong magnetic close box. They have been designed with the modern psychic in mind so these cards are easy to use and understand in today’s modern times. Katy K worked together with Jen Mulligan Design to design & develop a beautiful, functional & high quality oracle card deck called The Modern Oracle aimed at the modern day psychic. The Modern Oracle is an easy to use deck that is appropriate for all levels of experience. This vibrant deck of cards deliver a modern twist providing practical guidance and clarity in the world of today. The Modern Oracle is for the Psychic of today and those seeking guidance. 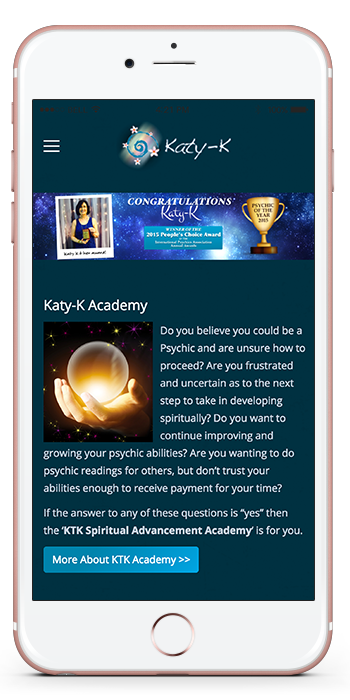 The website for Katy K prior to the redesign was bright & colourful but was plagued with bugs, limited in functionality, could not accomodate tablets or mobiles effectively & experienced layout & readability issues. 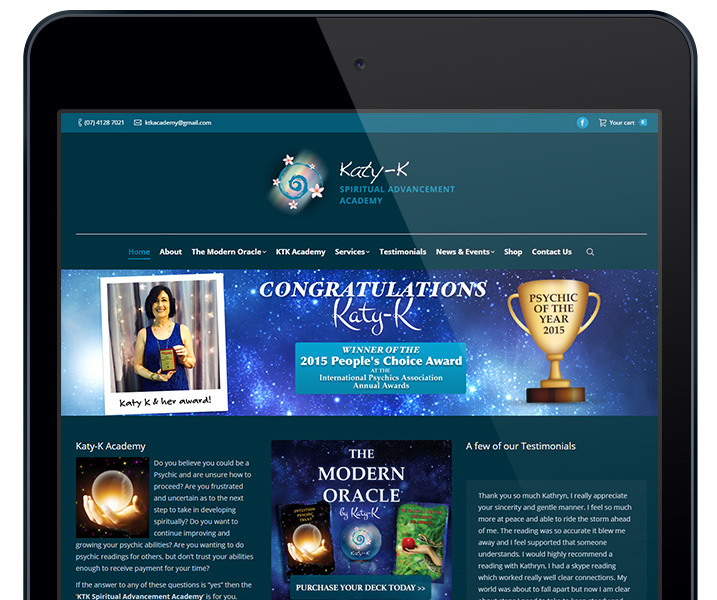 After the redesign, Katy K has a professionally designed website that is optimised to display on a range of devices. It has special enhancements built into the website including an events calendar, an online store, upload email newsletters straight to the blog, testimonial & image galleries, stockist & tutor indexes and more.